If you are a lead buyer interested in working with lead brokers, that’s great! Lead brokers can provide you with numerous targeted, high-quality leads while allowing you to focus on closing deals rather than generating leads. However, not all lead brokers are created equal. That is why we assembled this list to give you a better idea of what the best lead brokers are offering their clients. 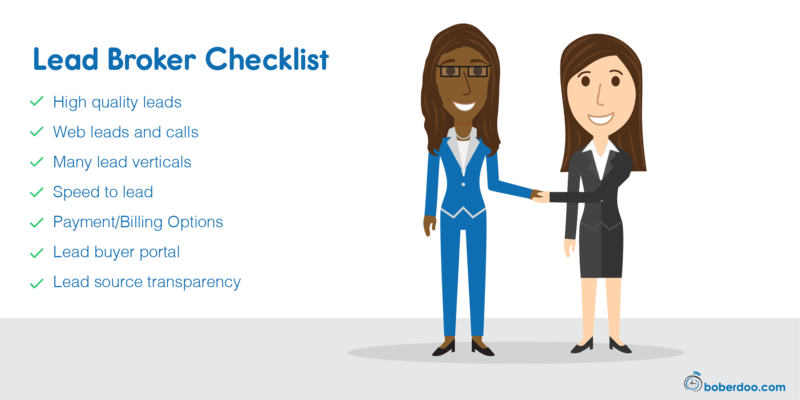 While each of these qualities and features may not apply to you, they can still serve as a good checklist as you evaluate lead brokers and the products and services they offer. We have to start here. If a lead broker does not provide high-quality leads, then there is no reason to move forward. Some lead brokers provide a few free sample leads that allow you to test their lead quality. You can also ask your lead broker if they use LeadQC or another lead scoring tool that prevents any bogus leads from being sold. The best lead brokers provide both web leads generated from an online form as well as live phone leads. Even if you are only purchasing one or the other, it is easy to identify an expert lead broker by knowing whether they generate both web leads and calls. If a lead broker is offering you standard, one-size-fits-all leads, you might want to look for alternative options. You should be able to specify the exact types of leads you are willing to purchase and never buy a lead that does not meet your criteria. For example, if you are purchasing auto insurance leads, you can specify that you are only willing to purchase leads of Illinois drivers that are currently uninsured. You should also know whether the leads you are purchasing are exclusive (sold only to you) or non-exclusive (could be sold multiple times). A clear sign of a great lead broker is one that allows you to request lead refunds. The lead broker typically lists a set of circumstances that warrant a lead refund such as bogus lead information or a disconnected phone number. While this does not guarantee that every refund request you make is approved, it does show that the lead broker cares enough about their service and their clients’ happiness. Another indicator of experienced lead brokers is the number of lead verticals they operate in. Most lead brokers start by specializing in one lead vertical and eventually expand their offering. Oftentimes lead brokers that are offering leads in five or more lead verticals are pretty experienced in the lead generation industry. Although often overlooked, payment flexibility is a great sign of a good lead broker. Many lead brokers simply invoice their clients at the end of each month. However, if your lead broker is integrated with multiple payment gateways or even allows for trigger-based or automated re-billing, you know you are working with a veteran lead broker. While some lead brokers keep their lead generation practices a secret, many more are happy to explain exactly how they are generating their leads such as via email marketing or paid search. This transparency gives you a better idea of not only how the lead was generated, but also more information on the types of consumers that are converting. If your lead broker will not give any information as to where their leads are coming from, that may be a red flag. Like almost all businesses, a strong web presence is a good measurement of the company. This is especially true of lead brokers that focus on online marketing to generate their leads. Think about it, if a lead broker cannot assemble a decent website for their own business, how good do you think their lead generation materials are? One of the best resources lead brokers can provide you is access to your own lead buyer portal. Although many buyers prefer for their leads to be posted directly into their CRM, the availability of a lead buyer portal is a clear indicator of a high-level lead broker. Has a lead broker ever asked you about your sales process or asked for feedback about whether or not you were able to close a sale from any of their leads? You should be happy to get these questions. This means that your lead broker is looking out for the consumer and trying to make sure their service is as helpful as possible. It is always a good idea to think of leads as consumers, not data, so any signs of your lead broker trying to improve the customer experience will only benefit you in the long-run. Some lead brokers do a favor for their lead buyers by immediately indicating to the lead exactly which lead buyer(s) will be reaching out. This is typically done via an autoresponder email sent to the lead or can even be displayed on the confirmation page after a lead submission. By displaying your company name, your logo or any other information about your business to the lead upon submission, your lead broker is helping build a connection between you and the lead even before you make contact. This list was meant to serve as a high-level guideline for evaluating lead brokers. It is important to remember that lead price is not the only factor you should consider when working with lead brokers. At boberdoo, we have been working with lead brokers since 2001 so you could say we know a thing or two about this subject. If you have any questions about the list above or would like to learn more about lead brokers in general, let's get in touch. Fill out the form below!